Angel of joy...bringing happiness for the holidays and everyday. 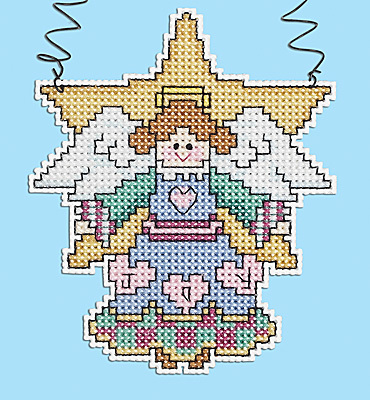 Angel Counted Cross Stitch Wizzer™ designed by Sandra Cozzolino. Fun to make and a joy to give! Each kit contains 14-count plastic canvas, 6-strand cotton floss, floss card, needle, wire for hanging, graph, and finishing instructions in English, French, Spanish and German. Quick and Easy! Size: 3.5" x 4.25".